Apple is running a new iPad commercial focused on film making, the ad is narrated by clips from director Martin Scorsese’s commencement speech at NYU from 2014. The commercial, which is similar in theme to the “Make Music with iPad” commercial (but not at all similar in audio), follows students at Los Angeles County High School for the Arts using iPad to create films. Video is embedded below for easy viewing. The accompanying website on Apple.com here details the various iOS apps used in the commercial, as well as the creatives featured. According to 9to5mac, the ad will debut on television during the Academy Awards show this evening. Appropriate, given the subject and Scorsese narration. 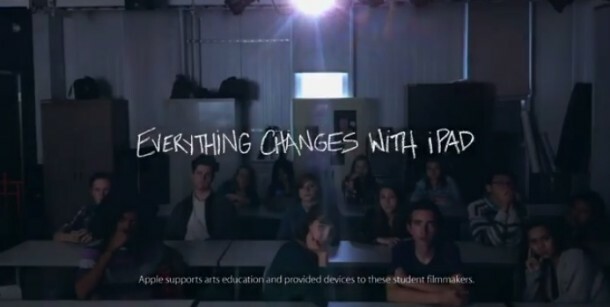 Good commercial, feels more like Apple. And let’s just say it, it’s much better than that last awful commercial they ran with the weird screaming noise with a terrible beat that maybe one or two kids call “music” these days, what a nightmare that thing was, I bet it was incredibly poorly received, probably why they yanked it so quick. To think someone made money making that prior pile of rubbish amazes me. Love Scorsese movies that guys a genius. Some people like commercials Homer, but not everyone wants to watch the Oscars. You can let us know what wins best picture, if you’d like. Maybe film it with your iPad? The commercial works — watched it twice. Both times I was thinking, “Wow, could I do that?” Well the answer is, No! I have no talent. But watching got me thinking. Isn’t that the point? Android Lollipop is pretty good, I don’t know if I prefer it to iOS 8 even though iOS 8 is full of bugs. Would it win best picture? That’s tough, I don’t think either. My preference is to iOS 8 because that’s what I’m used to, but Android is quite good these days, but it’s more complex and better suited for a different audience. It feels more like Windows to me, iOS feels more like a Mac. It’s all preference though, outside of the bugs in iOS! Hope Apple cleans up the bugs!